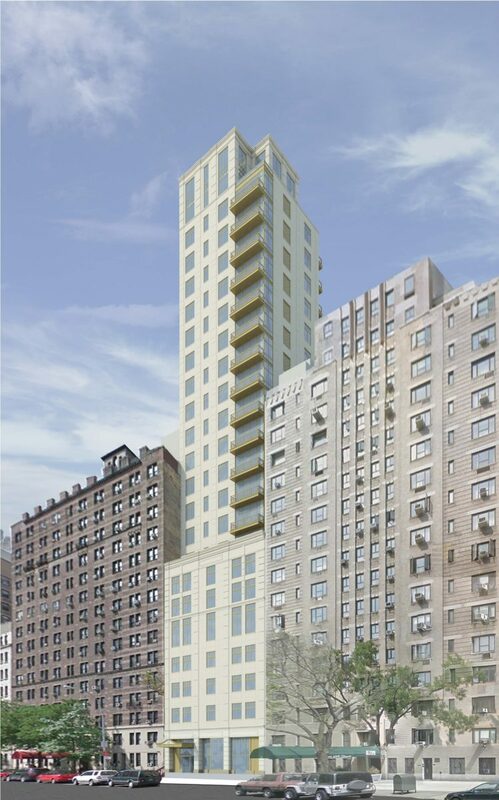 An updated rendering has been revealed for a potential residential tower at 15-19 West 96th Street, on the Upper West Side. The property is situated two lots west of Central Park and offers 60 feet of curb frontage. The Cushman and Wakefield firm has been retained exclusively to facilitate the sale of the site, which sits in an R9 zone and currently has an allowable residential FAR of 7.52. That could increase up to 10.0 thanks to a potential community facility bonus. The current asking price is $45 million. Current ownership has already completed demolition and has received approved plans for a residential building, as previously reported by YIMBY. The SLCE Architects-designed structure would rise 22 stories and offer a total of 60,310 square feet of mixed-use space. In order to qualify for the community facility bonus, the plans include 17,762 square feet across the first five floors dedicated to such a space. Potential developers would also benefit from an existing, fully executed contract for the sale of the community facility space to an end user for $29.8 million upon completion. The remaining 42,558 square feet of space would be dedicated to 16 condominiums between floors 6-22. Each would also have its own private outdoor space. Due to the first five floors being dedicated to community space, the structure is able to rise higher than its neighbors, offering units on floors 12 and above unobstructed views of Central Park. The site is one block south of the 97th Street transverse, also offering residents uninterrupted access to the Upper East Side. There is also immediate access to service on the B and C lines at the 96th and Central Park West subway station, as well as the 1, 2, and 3 trains, located at the Broadway and West 96th Street station. 2 Comments on "Updated Rendering for 15-19 West 96th Street as Site Hits Market for $45 Million, Upper West Side"
Please pardon me for using your space: In size of impressive structure, I’m okay with updated rendering.